The Byron Bay International Film Festival in New South Wales is strong on supporting independent filmmakers at all stages of their careers. Situated in a sub-tropical enclave with nearby world class beaches, the festival running until March 11, will likely stick to the blueprint of last year’s agenda that featured 35 public screenings in Byron Bay with introductions and Q & A sessions by attending filmmakers, free workshops and panels, industry networking functions, school screenings, family-friendly films, free showcases of experimental films and audio-visual experimental film performances. There is a balcony bar for the audience to mix with filmmakers, and extra public sessions held in neighbouring Lismore. 206 films were screened from 35 countries of which 72 were Australian films at last year’s festival. The Gala Red Carpet Opening and Closing Nights affairs are always highly anticipated with catered parties that attract full houses. 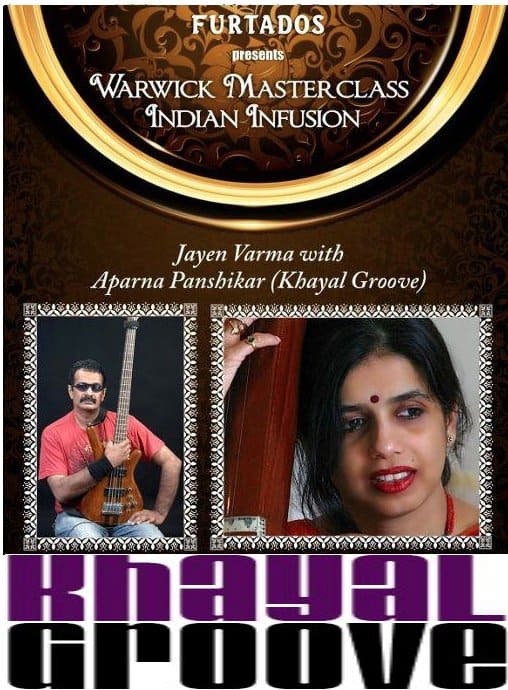 Khayal Groove is Aparna Panshikar on Vocals and Jayen Varma on Bass Guitar in collaboration with various artistes and bands across the world. The San Luis Obispo International Film Festival will have many special events for its festival goers to take part in when it opens March 7-11. And it will actually utilize San Luis Obispo’s Hearst Castle to relive Hollywood heydays of the 1920s and ’30s for one night at the “Hollywood to Hearst Castle” event on March 9. Photographer Timothy White, the recipient of the inaugural SLOIFF Spotlight Award, will start off the evening’s festivities by flying onto Hearst Ranch’s private airfield just as William Randolph Hearst’s high-profile Hollywood friends once did. This year, there is a focus on women filmmakers and issues. And there is a “Hollywood and Vines” series, pairing great classics with local wine and food. Next, be prepared to join the sing-along while enjoying the 1958 musical classic, ‘South Pacific’ on the big screen at the Galaxy Theatres for another special event. Wear a costume and compete for prizes at the reception in the VIP Lounge (age 21+) or just come for the film which will be screened in the VIP and regular theatres (all ages welcome). The Third Guangzhou International Theater and Cinema Facilities Import and Export Fair in Guangzhou, March 9-11, is a full presentation platform for the theater and cinema facility industry that includes – but is not limited to – the categories: Cinema Playing Equipment, Theater and Cinema Furniture and Decoration Materials, Theater and Cinema Lighting and Sound Equipment, Cinema services, Film Production and Shooting. In Austin, the much anticipated SXSW 2012 gets underway this year opening March 9 running through March 18. New festival offerings from last year that won praise will be given greater visibility this year, such as the combined SXSW Trade Show for the Creative Industries, which draws from all the events – Interactive, Film and Music. Another show feature, the SXSW Block Party, is modeled after a traditional pub crawl. Instead of bars, SXSW Registrants move between participating exhibitors for complementary refreshments and networking. SXsaloon plays host to the Trade Show Happy Hour at 5 pm daily, and is generally used as a place to get a drink, meet friends, plan a schedule, and just recharge before hitting the trade show floor again. Next Stage is the destination for entertainment on the first floor. Like a variety show, this stage hosts panelists, filmmakers, comedians, and musicians, and delivers a sample of all that is happening during SXSWeek. To enhance the networking experience, SXSW created a dedicated meeting space in the business epicenter of SXSW, the Trade Show Meet Up Pavilion. A First-timers Guide to the SXSW Experience is available online for download. The Universal Martial Arts Film Festival (UMAFF) will be held March 17 in Paris, showcasing films that explore the martial practice, philosophy, aesthetic and spirituality. The Universal Martial Arts Film Festival (UMAFF) encourages an emerging generation of filmmakers whose films treat various aspects of the field of the martial arts; those of the arts of combat and the arts of health. The purpose being to collect and to protect the collective memory, to educate the public, to share and to pass on the knowledge. Short demonstrations of Wushu, Aikido, Tai Chi, and other forms, take place between each projection. At the end of the screenings, all viewers can vote for the People’s Choice Award. An evening cocktail reception will close the festival. Hollywood Shorts Film Festival is a monthly screening program that celebrates the outstanding achievements in short filmmaking and animation from both U.S. and international directors and their creative teams. This month, screenings run in Hollywood from March 18-20. Over 300 short and animated films are programmed year round, and submissions are accepted year round. Hollywood Shorts began on October 9, 1998 at a popular live music venue in Los Angeles called “the Joint.” The overflowing crowd packed the house, and filled the sidewalk outside watching films by David Fickas and Mark Kelly, Frank Tota, and animation by Joe Pearson. The annual Spotlight Screenings began as part of our monthly series. These events include: African American ShortsFest at The American Cinematheque in February, Women Filmmakers Shortsfest in Spring, Animation Shortsfest in the Fall. Interested parties can join Variety and the Academy of Television Arts & Sciences Foundation in an exploration of how traditional television revenue models are being forced to adapt to the new disruptive technologies, and then to identify ways to continue to produce quality content and adjust financially to the new reality. Attending the 2012 TV Summit which will only be for one day on March 20 in Los Angeles will also benefit the Academy of Television Arts & Sciences Foundation’s wide range of educational activities. Established in 1959 as the charitable arm of the Television Academy, the Television Academy Foundation is behind such programs as the Archive of American Television, the Student Internship Program, the College Television Awards, the Fred Rogers Memorial Scholarship and the TV Faculty Seminar. An evening cocktail and networking reception closes the day’s activities. Bloomberg BNA | CITE, formed specifically to educate U.S. and foreign multinationals and companies engaged in international business on the tax, legal and accounting aspects of doing business overseas, presents the International Film and TV Finance Summit in Los Angeles, March 22-23. Explain ways to generate financial support for films utilizing brand integration and product placement. Reveal how sales agents and distributors can generate the domestic and foreign distribution needed to make a film a success. Discuss the role of banks and specialized finance companies in providing financing for film production, and other industry related topics. An innovator of Indian Slap Bass Style, who is currently recording the first album with his band, Khayal Groove, featuring classical vocalist Aparna Panshikar, Jayen Varma will have a series of engagements throughout March including song composing, recording sessions, master class workshops, and a major recital at Kochi’s largest performing arts venue, JT Performing Arts Center in Kochi-Kerala, March 24. In the Slap Bass style, Jayen Varma has applied Tabla/Mridangam finger technique on Bass Guitar. In 2008 The Registry of Official World Records (Record Holders Republic) USA & UK, declared him the world’s Fastest percussive bassist. The Female Eye Film Festival (FeFF) celebrates its 10th Anniversary edition, showcasing international women directors from around the globe, when it launches its festival in Toronto, from March 28 through April 1. The FeFF selectively presents a few short films, co-directed by a male/female team, annually. The Script Development Program is open to female and male writers with the provision that the script features a female protagonist. All panel discussions, script readings, industry events, receptions and the Closing Awards take place at the Novotel Toronto Centre. The above events are only a sample of what is fully listed. Complete details are on the “Media, Entertainment and Performing Arts Industry News and Events” page which now has a language translation button to convert page contents into most widely read languages. Also this month is a new undertaking to offer the news summary in various translated versions, viewable as a .pdf document and delivered via file sharing and content delivery network protocols among other means. Gazing ahead into this month, March, be aware that… The epicurean oriented Sonoma International Film Festival, blending the pleasures of fine food, film and award winning wines will be in Sonoma. The Palm Beach International Film Festival comes to Palm Beach. Fantastic Planet: Sydney International Sci-Fi & Fantasy Film Festival, will be in Sydney. London Independent Film Festival for micro-budget and no-budget films launches in London. NAB 2012 will be in Las Vegas. And 2012 International Independent Filmmaker Expo will be in Miami, just to run through some events drawing close to be aware of. And don’t forget that the News and Events and the site blog have translation tools to deliver page content in an array of translatable languages other than English.